We’d love your help. Let us know what’s wrong with this preview of Our Wild Magic by Amanda Linsmeier. To ask other readers questions about Our Wild Magic, please sign up. Heart-wrenching, raw, and so honest. It’s like Linsmeier has captured everything it is to be a woman and woven a spell of words with it, so you want to wrap yourself in it like a cloak. Will reread over and over! I loved this collection! As soon as the paperback is available, I’m going to buy one so I can mark up my favourites. Most often, I read a book once and rarely ever read it again, even if I loved it! My excuse is there’s too much to read to look back. But Our Wild Magic will definitely be something I pick up again. I look forward to reading more poetry books from Linsmeier. In the same way fairy tales speak to us with their wildness, cruelty, and bright hope, Linsmeier’s poems use beautiful imagery of magic and myth to illustrate our everyday human emotions. This collection soothed and inspired me, for while anxiety and fear are the deep dark forest, the right words are the spell that can fix us, whether we’re the wronged hero or the wicked witch—and of course all of us contain both. Some of the poems reference a specific story (Cinderella, The Wizard of Oz, Goblin In the same way fairy tales speak to us with their wildness, cruelty, and bright hope, Linsmeier’s poems use beautiful imagery of magic and myth to illustrate our everyday human emotions. This collection soothed and inspired me, for while anxiety and fear are the deep dark forest, the right words are the spell that can fix us, whether we’re the wronged hero or the wicked witch—and of course all of us contain both. Some of the poems reference a specific story (Cinderella, The Wizard of Oz, Goblin Market, The Six Swans...), while others use just a hint of archetypal detail, though with a pleasing theme of magic and wildness running throughout. An ultimately uplifting feel for those of us who like that kind of thing! Our Wild Magic is truly a magical read. Her words pour off the page and dive deep into the soul of the reader. Every emotion you can imagine is found woven throughout her pages. The only way to describe Our Wild Magic is simply, phenomenal. Linsmeier's writing is eloquent and raw, with a sprinkle of enchantment. Her talent for crafting poetry shines through in this alluring collection. Definitely pick this one up, as well as her other works. Poems so beautiful, I'm seriously going to have one of them printed and framed and placed in my bedroom. I love this collection!! Although some of the entries in OUR WILD MAGIC are no more than a line, each poem in this collection is powerful in its own right, and arranged together they form a tapestry as rich as life itself. Amanda Linsmeier's observations are so astute, her emotions so heartfelt, reading her words feels like talking ones best friend. These poems are intensely personal, style never getting in the way of the author's truth. Yet, there is such rhythm in the language, such beauty in the flow of words, they p Although some of the entries in OUR WILD MAGIC are no more than a line, each poem in this collection is powerful in its own right, and arranged together they form a tapestry as rich as life itself. Amanda Linsmeier's observations are so astute, her emotions so heartfelt, reading her words feels like talking ones best friend. These poems are intensely personal, style never getting in the way of the author's truth. Yet, there is such rhythm in the language, such beauty in the flow of words, they paired themselves to melodies in my head at times. Amanda Linsmeier has done it yet again. I was in love with "Like Waves" for its brutal honesty about things that many women endure, but I think "Our Wild Magic" takes the cake. The poems cover so many vital topics, some of which I felt the need to pause after reading to take it all in. Her writing style is unique and beautiful, some poems rhyme and some flow in a way that cannot truly be described without some faux pas remarks about rivers and oceans. I cannot wait for the world to receive this Amanda Linsmeier has done it yet again. I was in love with "Like Waves" for its brutal honesty about things that many women endure, but I think "Our Wild Magic" takes the cake. The poems cover so many vital topics, some of which I felt the need to pause after reading to take it all in. Her writing style is unique and beautiful, some poems rhyme and some flow in a way that cannot truly be described without some faux pas remarks about rivers and oceans. I cannot wait for the world to receive this beautiful collection, and for the world to recognize this amazing author. Quietly powerful, Our Wild Magic delves into the heart of womanhood with a tender sincerity that kept me turning the pages. Among my favorite poems in the collection were those that defied expectation by turning well known fairy-tale tropes on their head. 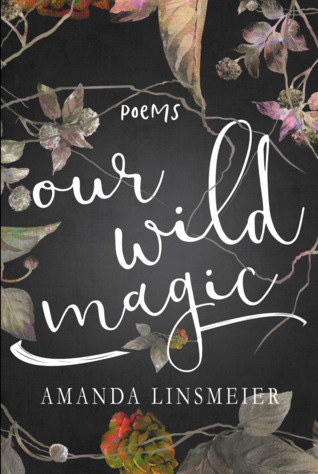 Our Wild Magic is a wonderful balancing act between shorter bite-sized poems and longer works that demand the readers complete attention in order to truly savor the nuances of Amanda Linsmeier’s writing. There is truly something magical about her words. You’ll find the good, the bad, the ugly, and all the beautiful truths that make us human but with a twist of fairy tale vibes. You feel it. All of it. So many of her poems resonated with me, and I think it takes a strong person to show the most vulnerable parts of ourselves. I LOVED this collection!! Editorial Blurb: Amanda Linsmeier writes with the sort of naked candor that is just as sobering as it is whimsical. Reading Our Wild Magic is like sitting down to tea with an old friend--one who has just returned from holiday in the Underworld. Another wonderful book of poetry from this author. It's raw, uninhibited, and soulful. It's honest and sometimes a little wicked. If you like poetry even a little, pick this one up. If you're not too much into poetry (like me), do yourself a favor and get this one. You'll love it! A brilliant collection of brilliant poetry that is beautiful and breathtaking. Beautiful poetry. I couldn't get into the style as much as I really wanted to, but I still enjoyed the writing and can't wait to read more from this author. Instant classic. That's what kept coming to mind as I read this gorgeous collection of poetry. It's an instant classic. Drawing from stories we all know and love- the fairy tales and myths that have fascinated people for centuries -Linsmeier takes readers on a journey. She uses the whimsy of make-believe worlds, the magic we longed for as children, to show us how our own lives can read like a storybook. We go through trials. We fall down. We have hard times, we struggle, but we persist. We rise Instant classic. That's what kept coming to mind as I read this gorgeous collection of poetry. It's an instant classic. Drawing from stories we all know and love- the fairy tales and myths that have fascinated people for centuries -Linsmeier takes readers on a journey. She uses the whimsy of make-believe worlds, the magic we longed for as children, to show us how our own lives can read like a storybook. We go through trials. We fall down. We have hard times, we struggle, but we persist. We rise up, over and over again, even when it's hard to do. It's what makes us human. Our Wild Magic will appeal to any romantics, as it did to me - a whimsical book, which is ultimately rooted in reality. Amanda describes our own lives as 'enchanted' - more than any story. There are different styles of poetry throughout and i enjoyed the variety. There are patterns within the sections - for example, the black out poems taken from Linsmeier's favourite poets, prose poetry and very short and compact poems. Poems such as 'Snow White' had echoes of Amanda Lovelace's 'The Princess Save Our Wild Magic will appeal to any romantics, as it did to me - a whimsical book, which is ultimately rooted in reality. Amanda describes our own lives as 'enchanted' - more than any story. Poems such as 'Snow White' had echoes of Amanda Lovelace's 'The Princess Saves Herself In This One' - Amanda wants us to wake ourselves up and stop waiting. The black out poems were the strongest for me: 'suddenly/twist out of element, a kick of air/ recoiling under ripples, leaving/ torn to repair/ and I experience a small completeness'- think Amanda has an eye for drawing out powerful imagery from the original poems. I received this volume from Pressed Poet. One reason why I purchased it was because of the shining reviews here on Goodreads. My consensus: This volume has some shining lines, and a few overall stunners. However, the rhyme scheme is limiting and the speaker lacks vulnerability. My favorite poems in this collection were the blackout poems. "Thunderstorms" and "Love Letter to the Earth" were my favorite free-verse / non-blackout poems because they were the most vulnerable and honest. While the con I received this volume from Pressed Poet. One reason why I purchased it was because of the shining reviews here on Goodreads. My consensus: This volume has some shining lines, and a few overall stunners. However, the rhyme scheme is limiting and the speaker lacks vulnerability. My favorite poems in this collection were the blackout poems. "Thunderstorms" and "Love Letter to the Earth" were my favorite free-verse / non-blackout poems because they were the most vulnerable and honest. Really enjoyed this! I love how it's spilt in 5 different parts (my favorites being wicked and ever after) and gives it a sense of progression which is always nice. All the tie ins to fairy tales makes for a really interesting and lyrical read. a beautiful collection about the joys and adversities, as well as the inner struggles and conflicts, that one encounters throughout multiple stages of life. i loved the fairytale references and the inclusion of black-out poems. Amanda Linsmeier is the author of Ditch Flowers (Penner Publishing, 2015) and Beach Glass & Other Broken Things. Her writing has been featured in Feminine Collective, Portage Magazine, Literary Mama, and Brain, Child Magazine. Besides poetry, she loves fables, fairytales, and fantasy, and sometimes she pretends her Hogwarts letter is still coming. When she’s not writing, she works part-time at her local library and brings home more books than she has time to read. Amanda lives in the countryside, surrounded by trees, with her family, two dogs, and two half-wild cats.